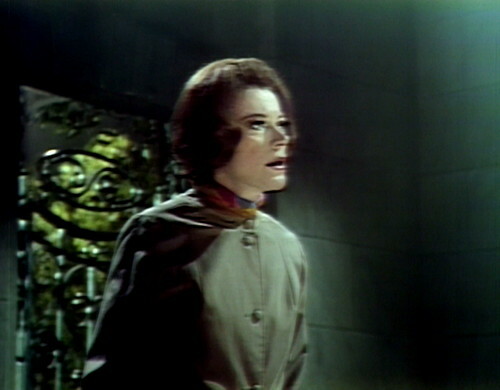 At the end of yesterday’s episode, Barnabas snuck into Maggie Evans’ bedroom, with the intention of luring her to the basement of the Old House, where she would be hypnotized and have her life force sucked out of her body in a Bride of Frankenstein experiment. And the banoodles thing is: She actually has. Literally seconds before Barnabas arrived to kidnap Maggie, Willie broke into her room, chloroformed her, and carried her away. That’s how bad things have gotten in Collinsport these days — if you want to kidnap a girl, you have to take a number and wait your turn. There’s actually a line of monsters and malefactors just outside Maggie’s bedroom, tapping their tentacles and muttering, Come onnnnn! What’s the hold-up? So the only thing Barnabas and Julia can do is stand around in what I think at this point we have to refer to as their lair, reviewing the game tapes and trying to figure out how to improve their completion percentage. Now, today’s episode is notable for being even more of a struggle than usual to make it to air. As I’ve mentioned before, editing videotape in the late 1960s was difficult and expensive, and daily soap operas didn’t have the time or the budget to waste on cutting tape with X-Acto knives just because the set wobbled or the camera drifted into the shot or one of the actors caught on fire. They performed the episodes “live-to-tape”, as just one long half-hour take, including pauses for the commercial breaks. And if somebody made a mistake, then they kept rolling, and maybe it’ll be better next time. This wasn’t unique to Dark Shadows; it’s how all of daytime television worked in the 60s. The other soap operas adjusted to this difficulty by performing slow-paced, repetitive scenes always filmed from the same angle, like a stage set. People on the other daytime shows mostly just sat around and talked to each other. But Dark Shadows was assembled by lunatics, who wanted costume changes and dream sequences and magic mirrors and fistfights with a Frankenstein monster. So Dark Shadows was always operating pretty close to the edge. They were usually taping about a week ahead of airtime, but there were some weeks when they were actually taping just one day ahead. Today, the situation is even more fraught than usual. Halfway through the episode, they’re going to do a flashback sequence, 1968-style — which is to say that they’re going to put on their old costumes, and record a scene from last year all over again. They can’t just splice in the tape from the old episode, because the show was filmed in black-and-white then, and besides, it’s more fun this way. Unfortunately, things go awry, as they so often do. They tried to pre-tape the flashback scene in the morning, but there was crosstalk in the soundtrack, and they had to do it again. This dragged on, and they ran out of time, so they just went ahead and taped the dress rehearsal, and that’s what we’re looking at. This gives us a rare glimpse of what the show would be like if they were even less prepared than usual. And for act 1, at least, it lives up to all expectations. Things settle down by act 2, and we can get on with the normal business of terrorizing Maggie. Willie is desperate to hide Maggie from Barnabas and Julia, so he’s brought her to the secret room in the old Collins mausoleum, where Barnabas was originally laid to rest in a chained coffin, back in his vampire days. This is not a smart move for several reasons. For one thing, it’s a secret room in a mausoleum. Willie spends the entire episode trying to get Maggie to trust him and not freak out about her abduction, but the setting does not inspire confidence. Reason number two: This is the site of one of Maggie’s most traumatic experiences, back when Barnabas was brainwashing her and trying to turn her into his dead ex-girlfriend. He actually locked her up in the coffin in order to punish her for resisting him, and that coffin is still in the room. This is literally a room where she was tortured. And reason number three: Barnabas and Julia know where this room is, and they know that Willie knows about it. This plan isn’t quite as dumb as hiding behind a tree in the front yard, but it’s a close second. In fact, Barnabas was just saying a minute ago that Willie probably drove Maggie somewhere, and they must be miles away by now. That would have been a way better idea. Willie is actually worse at making plans than Barnabas is, which I didn’t think was possible. This also isn’t a great move for the writers, because it’s yet another dull lock-up-the-girl story, which they’ve done a lot of times and it never turns out to be interesting. I can usually blame these locked room stories on Ron Sproat — see the blog’s Sproatnapped tag for the many, many examples — but this time Maggie’s stuck in the mausoleum for a week, and it’s all Gordon Russell and Sam Hall episodes. Locking people up against their will — in jail cells, closets, basements, bedrooms, coffins and mental institutions — always turns out to be boring. I get why a soap writer would reach for that plot point; it gives you several episodes worth of story, and the dialogue is basically just variations on “Let me out!” But at the end of the day, you’re going to have to let them out eventually, and then what? The one bright spot in this particular confinement story is that Maggie’s starting to remember what Barnabas did to her, picking up a loose thread that’s been dangling for more than a year. The show’s audience grew much larger over the last year, so there are a lot of people watching the show right now that never got a chance to see Barnabas’ early days, and this flashback was probably super exciting for them. That’s lost to us now, because we’ve got DVDs and streaming video, and we can go back and watch those episodes any time we want, but in 1968, this was a one-time-only treat. Plus, we get to see Julia in her frumpy old wig again, which reminds us to be grateful that she doesn’t wear it anymore. So what the hell, everybody’s excused today. It’s a big mess for everyone concerned, but that’s the thing about a daily serial: there’s always tomorrow. Tomorrow: The War on Halloween. 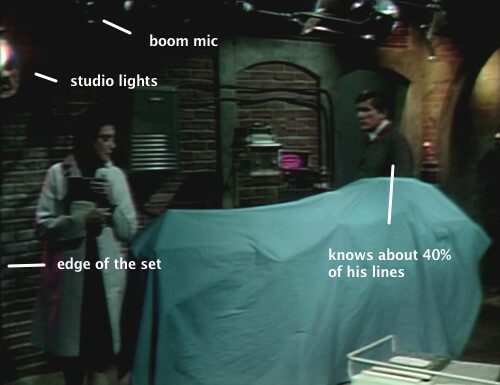 In the teaser, when Barnabas says, “Where else could she be?” the boom mic drops into the shot. In act 1, when Barnabas says, “It might be too late to do anything now,” there’s a scraping sound from the studio. When Barnabas says, “What if he didn’t take her by force?” there’s a stray music cue — a huge dramatic sting that they use for big cliffhanger moments. As Julia walks around the table, we see the boom mic at the top of the frame, the edge of the set on the left, and the studio lights. Julia says, “We both know that this time, Adam will go through his thr — with his threat, won’t we?” At the same time, there’s a weird tapping on the soundtrack. When they transition from the Old House basement to Willie and Maggie in the mausoleum, there’s another stray music cue — one of the sweet woodwind pieces that’s usually meant for a happy morning scene. This overlaps with the correct music cue as the mausoleum scene begins, and the woodwinds fade out. To introduce the flashback, Maggie looks off into the distance and tells Willie what she remembers. But there’s also pre-recorded narration over the flashback, and Maggie overlaps herself. There’s also a weird echo for the first sentence of the flashback narration. Maggie’s flashback is based on a sequence from episode 283, which aired in July 1967. So I’ve been reading every day and it just now struck me that this show is convinced that life force is gendered. Yes Adam wants a female mate, but why does the life force supplier have to be female. I mean Adam didn’t get Barnabas’ personality, so why do they have to find a woman. Okay, I’m sure there would be outcries if they used a man because they would think it was coding gay, but really why? I’m also so sorry for Maggie here. She really is just a tool to Barnabas. He wanted to use her to become Josette. Now he wants her to make a mate for Adam. His total self-centeredness is pretty awful. But even worse is Julia. She was Maggie’s doctor. She spent weeks or months with her trying to cure her from the trauma of what Maggie suffered. And she really doesn’t care that much about Vicki. I mean I don’t remember a whole lot of angsting from Julia when Vicki goes back to be with Peter. This whole thing is really discomforting. I couldn’t have said it better! Willie may not be the brightest bulb in the chandelier but at least he has a conscience and a sense of decency. Barnabas and Julia seem morally bankrupt at this point in the series. By the way in my personal opinion the wig hairdo (the one Julia had when she first appeared on the show) suits her character better. It makes her seem formidable and intimidating – the short cut makes her seem more vulnerable which is not how she started out. I prefer the version of Julia in the episode where she fools Barnabas by putting pillows in her bed when he comes to strangle her, establishing her as a master manipulator. Joann Julia’s hair helmet. Barnabas does need to check himself with Maggie and Vicki and let both of them go. 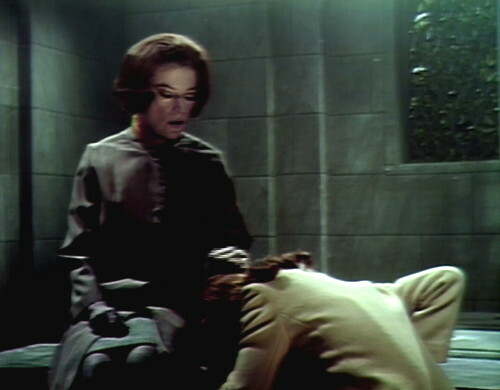 Julia as Maggie’s doctor betrayed her BEFORE she met Barnabas. Remember her threat that Maggie would remember if she was not there to erase her memory? It means that she was suppressing that memory by the time she got to Collinsport, as a bargaining chip. I honestly was never sure if she was just bluffing Barnabas. I don’t think we ever saw Maggie remember until Sarah found her. Maggie probably would have remembered eventually, especially if she had been receiving decent psychiatric care, so in that respect Julia was telling the truth but I didn’t think she was wiping her memory until Maggie came back to Collinsport. Julia saw the blood samples, so she knew the nature of Maggie’s illness. Barnabas may have gotten those slides out of Dr. Woodard’s office, but he wasn’t even aware of the samples Julia would have taken at Windcliff. Even when Dave Woodard visits Julia at Windcliff early on trying to get some answers she comes across as devious and secretive, as if she knows far more than she is letting on. After she escapes from Windcliff, Maggie’s memory spontaneously returns while in Dr. Woodard’s office, so it’s possible this may have happened at Windcliff as well, if only partially, but enough so that Julia could connect the dots. Barnabas does become her prime suspect even before Maggie’s memory returns–why else would she have herself installed at Collinwood to begin with to search for clues of Maggie’s disappearance? At first Julia seems to have grand altruistic ambitions to advance the cause of science as she outlines details of the initial experiment to Barnabas, but in the end she realizes that she is in love with him and ultimately becomes a full-time houseguest and family physician to the Collins’ just so she can be near him. I believe Sam Hall mentioned at one point that it was Grayson’s idea to have Julia secretly in love with Barnabas. I wonder if Grayson Hall was actually smitten with Jonathan Frid in real life. I don’t see Julia’s attraction to Barnabas in the early cure storyline. She seems intrigued by him like a lab rat and is willing to commit almost any crime to maintain the experiments, but I don’t see love or even lust. I think there is a distinct and sudden shift when Julia is written as loving Barnbas. It’s when she comes up with it as an excuse for Woodward. Prior to that, even her attempts to keep Vicki away from him is more self-preservation than jealousy. So, I guess my point is that I don’t see a subtle undercurrent of the relationship on Hall’s part until it’s on the page. That also makes sense because it’s just not believable for Julia to fall in love with the brutal, controlling, distant Barnaba (well, I guess it’s 50 Shades of Collinwood). 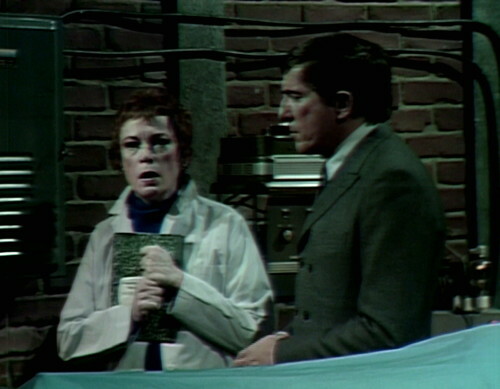 In HODS, Barnabas is written as more kindly toward Julia during the experiment, which tragically leads to the mixed message that spells his undoing. Well if you remember Julia did offer herself to Barnabas, but he was so busy pursuing others, as all men do when the cant see what is right in front of them. She tried everything and he still was not seeing her..until…Tom bit her and she thought she would die. To me, Julia is a real woman. She went after what she wanted, she did not succeed like she thought she would so she stepped back. Although the scene is laboriously paced, I loved the flashback scene. And not just because of the wig. I love soaps when they dig back into their past to keep stories moving. I loved it most when I was new to a soap; everything felt like a revelation. When Carlo Hesser was revealed to be “Poisiden” on OLTL in the 90s I was probably the only audience member who didn’t see how telegraphed that twist was, because I wasn’t watching when Carlo was last alive. I suspect the Josette/Barnabas callback felt the same way for those relatively recent fans. It gives the illusion of a cohesive past and backstory to the world unfolding before you, which is the one element that can make soaps feel kind of real, even when being completely batshit. To my ear, Julie says “Meg” instead of “Maggie”. very interesting point, that, dear Percy’s Owner, about genders and life forces. food for uncaught thought.